Vintage Old Postcard. Mauritius Ile Maurice - Port-Louis. Port Louis. Square Emilien Dueray. Place de la Pleine vert. 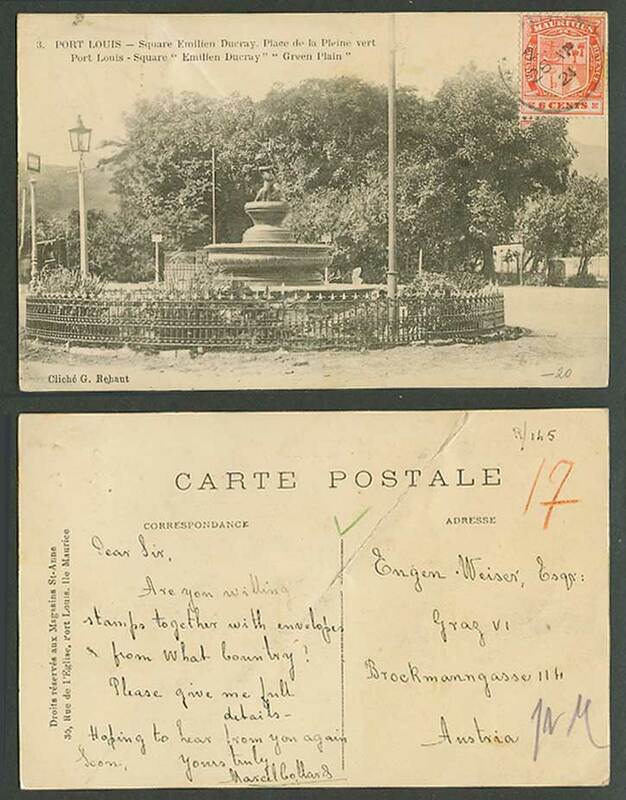 Port Louis - Square Emilien Ducray. Green Plain. Statue. Fountain. Postally Used in 1921 with 6c Coat of Arms stamp, addressed Austria. Background: Mauritius is an island nation off the coast of the African continent in the southwest Indian Ocean. In addition to the island of Mauritius, the republic includes the islands of St. Brandon, Rodrigues and the Agalega Islands. Mauritius is part of the Mascarene Islands.